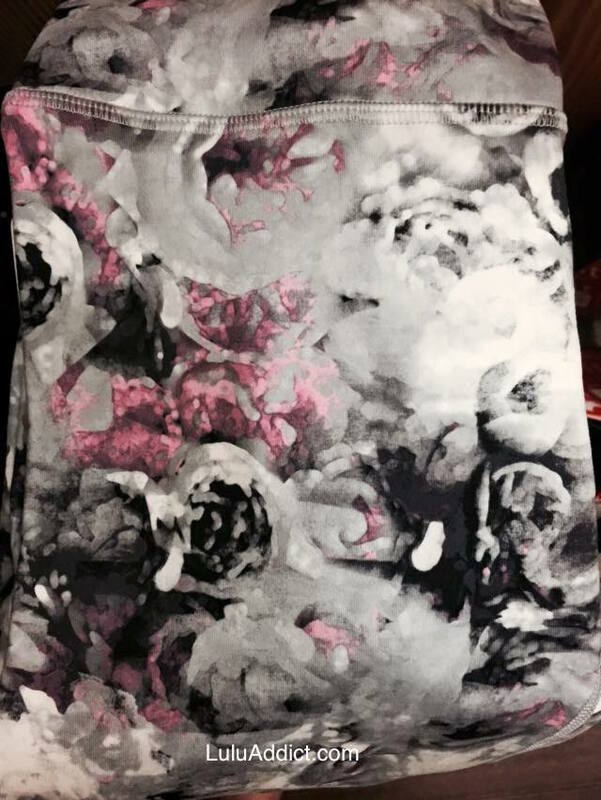 Thanks to Ms. S. for sharing her in-store photos of the Moody Mirage print. These are Roll Down Wunder Under crops and made of full on luon. This pair has an unfortunate cluster of black flowers. There is some variation between pairs so you'll need to cherry pick a little. Sheesh, embarrassing patter placement on that last one....definitely need to cherry pick these. @ anon 12:17 pm - Hmm, then they probably don't come in a 12 either. That is usually what happens when there are no 2s. However, I have often found the stores will get sent 4, 6, 8, first and then the rest of the sizes show up a few days later. 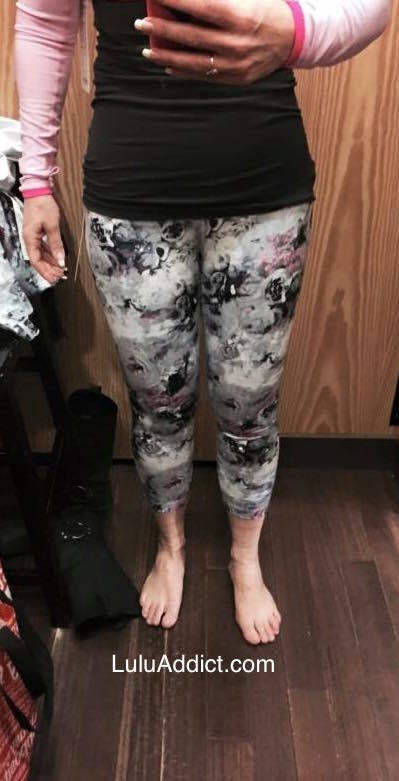 I would not be surprised if there isn't a 12 in this print since lululemon rarely puts out a 12 in a light color. I would prefer this print in a Power Y, though. @Pui Li - When you have to cherry pick patterns I know people who order a couple of pairs at the same time so they optimize good placement and then return the other pair. I went to my local store this morning, but they didn't have them!!! So pretty. I will try online this evening. @ anon 12:17 pm - The UK got the Moody Mirage WUCs in a size 2 so either someone bought it already or your store didn't get it in the initial shipment. I tried these on in my TTS 8 and found them NOT opaque - I could see the print on the white hang tag in a bend. However, the nature of the pattern is forgiving in that it's hard to tell whether things you are seeing in a bend are the pattern or what you are wearing underneath. I really loved the colors and the pattern and spent a bit of time hemming and hawing over whether to buy them. But in the end I couldn't spend my hard-earned money on something that deep down I know was not sufficient quality. My store also did not have a size up for me to try on to see if they were more opaque. I also tried on the Adustable All Sport bra. I so far have only purchased Energy Bras from LLL and they work well for me in a size 10. I tried on the 10 in the Adjustable All Sport and needed to adjust it to the smallest closure for it to feel as snug as my energy bras feel. So I tried it on in a size 8 and that felt better as far as the band went but I felt like I didn't have enough coverage in my armpit area. So I also left that at the store. You guys are funny. I don't think the women or men or chidren sewing these pants have time to look at the pattern placement. They are payed by the piece. @Ceags - As far as I know they aren't in Canada yet.